For over 25 years, laser interferometry specialist CONTROLE LASER MESURE (CLM) has been the French distributor of the world's leading laser measurement company KEYSIGHT TECHNOLOGIES (formerly HEWLETT-PACKARD and AGILENT TECHNOLOGIES). CLM has the most comprehensive offer on the market, ranging from the sale of equipment to rental with an operator on site, for the control and calibration (CNC compensation) of your measuring equipment and machine tools. A wide range of optics and components to meet your high-precision measuring needs (down to 0.15 nm). A comprehensive service offer, ranging from the design of custom-made equipment, to installation and training of your staff in their own work environment. On-site servicing to control your production and measuring equipment. Fast response throughout France and in other countries. 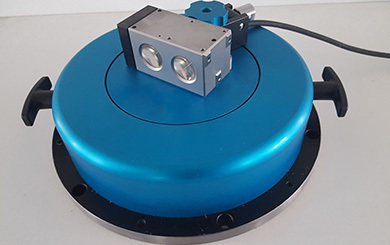 Accessory for interferometer laser AGILENT / KEYSIGHT 5529A and 5530. Available in diameter 250 mm and 130 mm. Accuracy better than ± 1".